On time Delivery and after Sales service. Additionally with the entry of Digital world – E-commerce for industry, IOT and Industry 4.0, Business becomes may be a bit more complicated but more easily accessible market. The industry owners in the MSME sector need to relook at their way of doing business and immediately start preparing for the future which is not far away. The way we run our operations, SCM and Logistics ,Quality etc needs to be world Class. We need to follow the business Excellence, Operational excellence and Process excellence systems to compete and reach out to global markets. To compete for the future we need to ensure that the basics systems are in place and World Class Systems (WCM) are followed. Once this is in (WCM) place embracing the Digital world will be that much easier. The govt of India also has initiated the ZED-Model of Business Excellence which is suitable for the Indian Industry. All the industry owners should take advantage of this ZED Scheme which will make the industry globally competitive. Clusters by Definition is a geographically proximate group of interconnected companies and associated institutions. But I would like to slightly deviate from the definition with the example I was told by a Taiwanese participant in a training program. There were 5 powder coating/Dip painting plants (all different owners) who joined together as a cluster. Each unit had business from different customers. They all had different colour’s each one of them had to process leading to high change over times, cost and delivery implications. They joined together and got themselves and their team trained in WCM. Next they shared their business based on colours. One unit does black and blue, 2nd unit does 2 other colours etc. By this they shared the business to reduce losses, shared their employee strength and help each other, common platform for training, common platform for logistics, inter seller-buyer relationship, technology upgradation, knowledge sharing of best practices and problem solving. By this they were able to enhance their top and bottom line. The only requirement from all was TRUST. In our Indian Scenario we can think about this proposal. Forming clusters and implementing WCM principles is the best way forward for MSME’s. ZED talks about the same. By working in clusters advantages are many as mentioned earlier- common platform for SCM, Training, knowledge sharing, Problem solving, shared resources etc. I would definitely encourage cluster approach and ZED scheme. WCM is not knew. Choose a consultant who can take your industry in this path. Following the principles of WCM(TPS,TPM,TQM ,TOC, and thru Policy deployment, Balance score card etc) only leads to enhanced TOP and bottom line ,consistent and sustainable performance from the industry. Watch out for more information on WCM and effective operations management. Raghavendra.B.S is a seasoned Mechanical Engineering professional with 30+ years of experience in Manufacturing Operations. He has extensive experience in driving operational and manufacturing excellence (Business Excellence) in reputed Auto/Aerospace / non-automotive industries. He has the ability to enhance the efficiency of the entire business process of the industry using Good Manufacturing Practices(GMP) and Lean Manufacturing systems effectively resulting in a profitable World Class Organization. 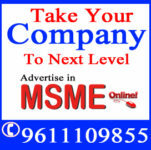 Sign up for latest SME news and important newsletters. © 2019 MSME Online. All Rights Reserved.